Few films have ever been released with the staggering amount of hype The Dark Knight had, and fewer still have ever lived up to that hype. Judging by the box office numbers, nearly everyone has seen this movie; if you haven’t, you should, because Dark Knight is groundbreaking in every sense of the word. I will forever remember the first time I saw the film, opening day at the IMAX; for me, that was the most powerful experience I’ve ever had at the movies. The action, the characters, the huge saga of a plot, the performances, the music…every last element of this film is gold. Not surprisingly, I’ve been waiting for the film’s home video release for months now; the film certainly made enough money that Warner could easily have dumped this on DVD and Blu-Ray without any care or consideration and still made a mint. Did they? Or does the Blu-Ray live up to the film? Find out in my review of The Dark Knight on Blu-Ray Disc. In Batman Begins, we learned how Bruce Wayne became Batman, and why. He dresses up like a bat so that he strike fear into the hearts of his enemies; it is his best weapon. The central theme of the film was fear. In The Dark Knight, Christopher Nolan and his team also use fear, but in a very different way. Fear is not on the minds of the characters. It’s on the mind of the audience; from start to finish, Dark Knight finds new ways to terrorize the audience. If you want to watch this film, be warned; it is terrifying. Because of the nature of the plot and the villain, and the way this plot is executed, the film is simply unrelenting. There are moments when you can’t catch your breath due to the deep fear it strikes into your heart. This movie transcends “dark.” Tim Burton’s Batman is dark. Batman Begins is dark. The Dark Knight is black; it forces you into the depths of insanity and holds you there, with only brief moments to catch your breath. And if you can handle it, then you’ll experience one of the deepest, most complex and finely crafted films in years. It goes without saying that The Dark Knight is the best film of the year. It also seems to go without saying that it’s the best superhero movie of all time, but I can’t justifiably make that statement. Why? Because it’s not a superhero movie. Batman is not a superhero. Christopher Nolan is the first director to truly understand this, and the film reflects that in many ways. It is possible that I have never been more excited for a film than I was for The Dark Knight. I tried to keep my expectations in check, but I couldn’t. When the lights dimmed in the theater, my heart was racing with excitement. Every time I’ve been this excited for a movie, I am inevitably disappointed, if not completely, than at least in some small ways. To say that watching Dark Knight was a new movie-going experience for me would be an understatement. I had expectations that were seemingly impossible, and the film shatters them. The character everyone has on their minds is, of course, The Joker, as portrayed by the late Heath Ledger. He has created one of the most memorable screen characters of all time, and is certainly one of the most effective villains I’ve ever seen. The Joker has no back story; he just appears, doing everything in his power to destroy Gotham. He is evil incarnate, and he has a sick sense of humor. Whenever he appears on screen, prepare to be deeply disturbed. Sometimes, you will laugh at him, and then feel bad for doing so. There’s a scene where he threatens Rachel Dawes with a knife; he starts telling her a story about his scars, and Heath Ledger throws himself so completely into the character that it feels as though the Joker might jump off screen and cut your throat. When the sequence is over, I for one, was relieved; I needed a break. The Joker is easy to single out for praise, but the rest of the cast is excellent. Christian Bale proves that he is far and away the best actor to don the cowl, and proves that he is one of the better actors of this generation. Michael Caine is again excellent as Alfred, as is Morgan Freeman as Lucius Fox. Gary Oldman is a terrific Commissioner Gordon, who gets a lot to do in this movie. Aaron Eckhart as Harvey Dent proves to be inspired casting; he’s great as the D.A. and as, later on, Two-Face. Maggie Gyllenhaal takes over the role of Rachel Dawes from Katie Holmes; Holmes was simply awful in Batman Begins, but Gyllenhaal is terrific. Rachel has a more important role to play this time around, and if Holmes had played the role, the movie might just have fallen apart. But good performances don’t make me love this movie. The real power comes from the amazing script by Jonathan and Christopher Nolan. They understand Batman better than anyone, perhaps. What they’ve done with the characters seems revolutionary, but really, all they’ve done is delve into the most classic interpretations and present the key components of the characters. The Dark Knight defines Batman, and heroes in general, in many ways. The ultimate message is that a hero is not necessarily someone people love; instead, it shows us that heroes are the ones in the shadows, sometimes even being the ones we despise. The film is rich with characters (it’s certainly an ensemble piece, a rarity in summer cinema) but never loses focus on Bruce Wayne. The plot is dark and complex, and you get a similar vibe as you would watching The Godfather. It’s not a story; it’s a saga. The amount of material packed into the 2 and a half hours is incredible; and yet, it’s a fast 150 minutes. And as a Batman fan, it was a miracle. To see a filmmaker delve so deeply into the psyche of not just Bruce, but a host of favorite characters, was a remarkable experience. Batman Begins was the movie that introduced us to the troubled mind of the character, and showed us why he dresses like a bat. It established that Batman is a symbol, not a man. The Dark Knight takes it a step further; it defines what Batman is, and what he means. Christopher Nolan did something revolutionary with the cinematography of Dark Knight; he shot a sizeable portion using IMAX cameras, a feat never before attempted in a Hollywood film. In theaters, the IMAX scenes literally took my breath away each and every time they appeared. The clarity of IMAX film is beyond imagination, and Nolan utilized IMAX to give an extra ‘oomph’ to his action scenes and an extra layer of wonder to the film as a whole. I, for one, was disappointed when I saw the film again in standard 35mm, because I thought the IMAX resolution and size was essential to the film, and 35mm cropped all the IMAX footage. Thankfully, Blu-Ray owners will never have to worry about seeing the film again in any way but the originally intended way. On Blu-Ray disc, the film is presented in its IMAX version; most of the film is in 2.40:1 with black bars on the top and bottom of the screen, but the IMAX footage is presented at 1.78:1 (cropped slightly on the top and bottom to fit a 16:9 display). The difference between the two, even at home on a display much smaller than that of IMAX, is night and day, and it’s not just the size. The IMAX footage is the best-looking live-action HD image I’ve ever seen. The colors are represented flawlessly, and the detail is beyond what even the best 35mm HD images can provide. There’s a shot in the last third of the film where citizens are mass-evacuating Gotham, and you can see every last one of the thousands of people, and can even tell what color clothes each one of them is wearing. It’s astounding. These parts of the film will convert even the staunchest disbelievers in Hi-Def to running out and buying a Blu-Ray player. Audiophiles will be pleased as well, because the Blu-Ray features top-notch sound. Every sound effect is crisp and resonant, with explosions that will shake the entire living room. The music in particularly impressed me; apart from theaters, this is the best I’ve ever heard the score sound, but it’s balanced so as to not overpower the dialogue. Despite that, dialogue does become to quiet on occasion; however, that’s a small quibble. This is a great audio track. 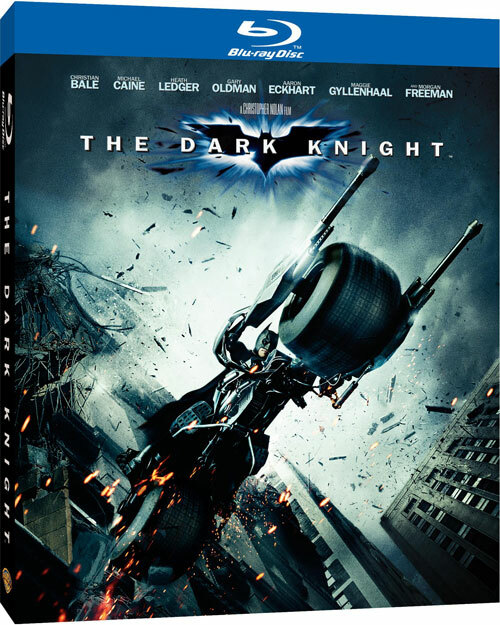 The biggest film of the year arrives with a lackluster set of special features …never heard that one before…Sarcasm aside, the extras given to us on the Dark Knight Blu-Ray would barely be passable for a small action film, let alone a movie that is destined to be a cinematic classic. The best extras are on Disc 1, which, in addition to the film, contains Gotham Uncovered: Creation of a Scene. In this feature, 20 or so short vignettes (ranging from a minute to 7 or 8 minutes) take viewers inside the creation of many of the most amazing shots of the film. We learn about using IMAX cameras, explosions, how the Bat-pod was made, how they achieved the 18-wheeler flip, etc. All together, they run for about an hour and every second is solid gold. This is a treasure trove of information, and the perfect supplement to the film itself. You can watch them individually, all at once, or during the film; a pop-up will appear, you click the remote, and are taken to the vignette. I wish this was a Picture-in-Picture commentary, but it’s good enough as is. As sad as it sounds, Gotham Uncovered is the only really worthwhile extra in the set. Disc 2 contains no making-of material…at all. The first two features on Disc 2 are two documentaries, Batman Tech and Batman Unmasked. Both are TV specials that I believe aired on the History Channel, and while both would be fun to come across on TV, neither one belongs in this set. They don’t have any specific relation to Dark Knight, except for some clips and interviews, and they don’t reveal anything about the Batman universe that most fans don’t already know. Tech examines the technology of Batman, while Unmasked discussed Wayne’s psychology. Seeing a scientist explain the grappling gun or a psychiatrist diagnose Bruce is all well and good, but why not have a documentary on the script-writing? The casting? Post-production? A tribute to Heath Ledger? You’ll find none of it on this set. The rest of the extras on Disc 2 are better, though still not anything special. 6 episodes of Gotham Tonight are presented; this is the fictional news program seen in the film, and I believe these episodes were shown online to market the movie. They are played straight, being produced as ultra-realistic news reports. In fact, GT takes itself so seriously that I found it to be a bit cheesy, but this is a very cool extension of the film and I’m glad to have these episodes. Altogether, they run about 45 minutes. A Gallery is also presented, and for my money, it’s the best thing on Disc 2. There are hundreds of images of Joker Cards, Concept Art, Production Stills, and Marketing; it’s all cool to see, though I wish there was a zoom option so I could get a better look at some of the pictures. Finally, 3 Trailers and 6 TV Spots are presented, and they are as awesome as you remember them to be. A Digital Copy of the film is presented on a bonus third disc; if you own an iPod, more power to you, but as a Zune owner, this thing is worthless. Obviously, the extras are not comprehensive; the documentaries are worthless, and Gotham Uncovered, while very well produced, isn’t enough to make up for the lack of a commentary or other Behind-the-Scenes footage. Obviously, a double-dip is planned for the future, but I wish the initial batch of extras was stronger. On the plus side, the Packaging is wildly creative; the outer slip-cover is the iconic Bat-pod poster, but the case itself is an image of the Joker, with the back cover humorously scribbled on by the clown. Comparing the real cover to the Joker’s graffiti is hilarious. I only wish the rest of the extras had the same level of creativity. The film is as terrific as it was in theaters, and the HD replication of the IMAX version is a home-run. Sadly, the extras amount to some cool behind-the-scenes vignettes and two documentaries slapped on in a lazy attempt to create a special edition. DVD buyers are really getting ripped off, as the 2-Disc DVD contains only a small fraction of the extras on the Blu-Ray, and doesn’t contain the IMAX version. If you don’t yet own a Blu-Ray player, I’d recommend getting the cheaper 1-disc DVD and waiting for the double-dip. Or buy yourself a Blu-Ray player for Christmas, because despite the weakness of extras, the film’s HD presentation is spectacular enough to warrant a BD player purchase.